Slip, trip & fall accidents are one of the leading causes of fatal and nonfatal injuries among older adults, according to the Centers for Disease Control and Prevention (CDC). While these accidents are often preventable, when they do occur, they can have profound physical, psychological and financial impacts on injured people. 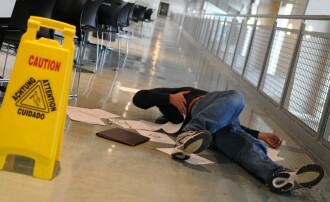 An experienced Littleton premises liability lawyer discusses the dangers and impacts of slip, trip and fall accidents. Contact us if you’ve been hurt in a fall accident. About 33 percent of all adults 65 and older experience at least one falling accident annually; however, less than half of these people discuss the accident with their healthcare providers. In 2013 (the most recent year for which complete data is available), about 2.5 million older adults were treated in ERs for fall-related injuries. More than 734,000 of these patients were subsequently hospitalized for further treatment. In 2013, the direct medical costs arising from fall injuries totaled about $34 billion. Poor lighting and/or poorly placed displays/shelving. People can be injured in slip, trip and fall accidents, potentially sustaining serious injuries – like head and brain injuries, spine injuries and/or bone fractures. These injured parties may have a claim against the negligent party (or parties), and consulting with an experienced attorney can provide them with more information about their best options for financial recovery. Have you or a loved one been hurt in a slip, trip and fall accident? If so, you can rely on an experienced Littleton premises liability lawyer at Bahr & Kreidle for experienced help pursuing justice and compensation. Since 1983, our lawyers have been fighting on behalf of injured people and aggressively standing up against injustice, inequality and intolerance. Our lawyers know how serious and devastating the impacts of slip, trip and fall injuries can be, and we know that many injured people depend on settlements to get the medical treatments they need. That’s why we are committed to being here to advocate injured people’s rights, help them hold negligent parties responsible and ultimately get them the highest possible awards for their injuries and losses.